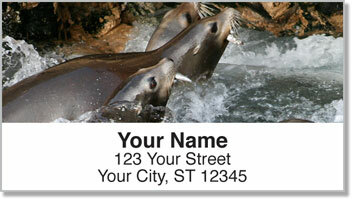 California sea lions are some of the most playful and social animals in the world. These marine mammals know that family time is all about having fun! If they aren't goofing around in the water, colonies of sea lions can be found beaching out on the rocks together. But these animals are always a joy to watch. 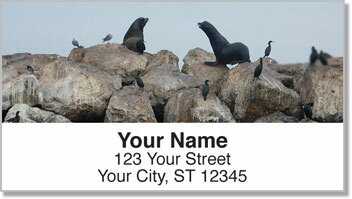 Our unique wildlife address labels feature photos of sea lions along the coast. Their friendly faces, with wispy whiskers and big brown eyes, remind us of adorable dogs. 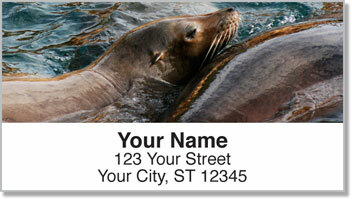 Sea Lion Address Labels make it easier for you to prepare outgoing mail. That means you have plenty of time left over for family fun too! 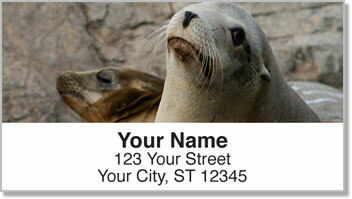 Get your own Sea Lion Address Labels today! This design can also be ordered as a set of matching personal checks.